Whenever a disaster strikes, access to accurate information and capacity of the disaster teams to respond with life-saving assistance are critical. Keeping this in mind, a team of students from IIT Madras designed an end-to-end autonomous system, to provide precise information about where exactly the people are stuck in case of a disaster with the use of unmanned aerial vehicles (UAVs) that are powered with AI and computer vision. “The system can efficiently distribute the drones to cover the maximum area, and perform intelligent tasks such as detecting people (both visible and partially visible), whether they are able to move or not and activity recognition to help in optimising the resources available,” informed Rajat Singhal an engineering student from IIT Madras. 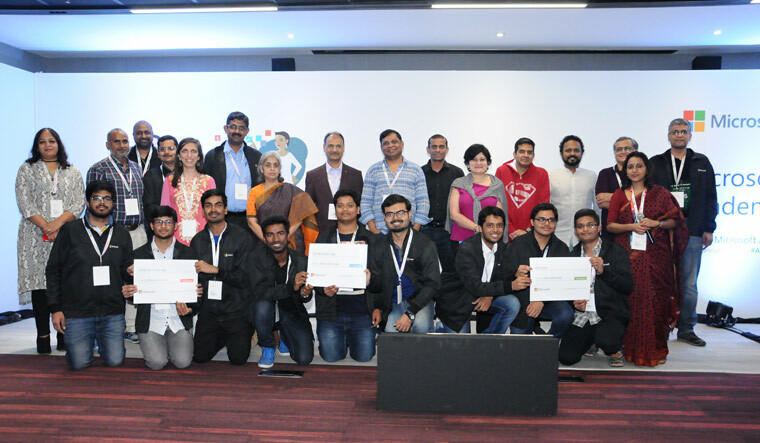 This team won the best prize at AXLE, a Microsoft Academia Accelerator, an annual showcase of collaboration between Microsoft and academia that was held in the IT city of Bengaluru. Similarly, the first runners-up team from IIT Guwahati had developed 'DUBG', a mixed reality app for efficient post disaster management. Rescuers are busy during an operation, which is why this app is based on mixed reality so that rescuers do not waste time on pre-planning their routes and operating any device for communication. “This app makes basic tasks like communication, navigation and current status-monitoring easy for rescuers. Our team’s vision is to create an augmented reality-based navigation system enhanced by voice assistant to make the rescue drives hassle-free,” explained Vivek Raj, an engineering student from IIT Guwahati who was part of the college team. The team used Microsoft's technologies such as Mixed Reality and Azure Speech Recognition to develop their solution. The team from IIT Jodhpur, who were the second runners-up, had developed an IoT-based solution that acts as an early warning system and takes precautionary measures on detection of disasters, offloading crucial immediate steps from the cloud to edge, while staying connected to the cloud for data storage and further analytics. The theme for the programme was AI for Good that showcased different innovative ways of using technology to solve real world challenges. The event had a congregation of faculty members from Computer Science, Microsoft employees and several industry experts, etc, who showcased different innovative ways of building technology to predict and manage natural disasters better. Academia Accelerator is Microsoft's campus engagement programme aimed at building a long-term association between the industry and academia in India. The company believes that new technologies such as Artificial Intelligence (AI) offer huge potential to build richer, cleaner and healthier societies. The technology can transform the output of people and organisations across every sector, including better management of catastrophes and disasters, and delivering relief materials wherever required. “Keeping in line with this, the theme for Codefundo++ National Challenge under Academia Accelerator was to build technology to predict or manage natural disasters better. The challenge had more than 5,000 participating students from across 21 colleges, and had 350 plus new projects. Among the entries there were top 21 teams that showcased their solutions at the event in Bengaluru. Broadly, the Academia Accelerator aims to provide insights to students about important technology trends and practices and adding industry know-how to the existing Computer Science curriculum,” remarked Chitra Sood, Director-Business Management, Microsoft India (R&D). The Academia Accelerator is a programme from Microsoft that involves engagement with college campuses through enrichment of computer science course curriculum and drives student innovation. This is done through participation in tech boot camps, guest lectures, adjunct faculty, curriculum reviews and development, leadership talks, technology workshops, joint research papers and mentoring student projects.